SECTION 179(2) of the 1999 Constitution of the Federal Republic of Nigeria as amended provides, “A candidate for an election to the office of a governor of a state shall be deemed to have been duly elected where, there being two or more candidates – (a) he has the highest number of votes cast at the election; and - (b) he has not less than one-quarter of all the votes cast in each of at least two-thirds of all the local government areas in the State”. The above, categorically presented requisites for emergence of a winner in a governorship election. Quintessentially, Section 1(3) of the Constitution states, “If any other law is inconsistent with the provisions of this Constitution, this Constitution shall prevail, and that other law shall, to the extent of the inconsistency, be void”. By this subsection, it is deductible the Constitution doesn’t exist in isolation instead alongside other laws. Thus, the Constitution remains the grundnorm - hub from where all laws draws their legitimacy and doesn’t impede other compatible laws. Concisely, Section 153(1)(f) established the Independent National Electoral Commission as a statutory body. In Paragraph 15 of the Third Schedule (Part 1), the Constitution distinctively empowers the Commission to - (a) organize, undertake and supervise all elections to the offices of the President and Vice-President, the Governor and Deputy Governor of a State, and to the membership of the Senate, the House of Representatives and the House of Assembly of each State of the Federation. In addition, Paragraph 15(f) provides – “to monitor political campaigns and provide rules and regulations which shall govern the political parties”. 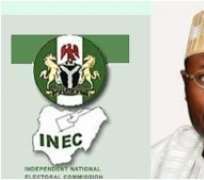 Thus, INEC’s 2019 Regulations and Guidelines in Paragraph 33(b) provides - “Where the total number of registered voters in the affected Polling Units is less than the margin by which the leading candidate is ahead of the second candidate, indicating that the outcome of the election will not be affected by the supplementary election, the returning officer shall announce the result”. On the other hand, Paragraph 33(e) states - “Where the margin of lead between the two leading candidates in an election is NOT in excess of the total number of voters registered in Polling Units where elections are not held or voided in line with Sections 26 and 53 of the Electoral Act, the returning officer shall decline to make a return until polls have taken place in the affected Polling Units and the results collated into the relevant forms for Declaration and Return. This is the Margin of Lead Principle and shall apply wherever necessary in making returns of all elections to which these Regulations and Guidelines apply”. Clearly, these rules didn’t indicate any mischief or witch-hunt against any candidate but a general guideline to ensure all votes credibly count. Again, in legal jurisprudence, “Qui approbat non reprobat” translates - One who approbates cannot reprobate. By submitting to INEC’s regulations and guidelines, there is no basis to contest the clause when it seemingly doesn’t favour a candidate amid the poll, without any distinctly inconsistency with the Constitution. Disclaimer: "The views/contents expressed in this article are the sole responsibility of Carl Umegboro and do not necessarily reflect those of The Nigerian Voice. The Nigerian Voice will not be responsible or liable for any inaccurate or incorrect statements contained in this article."